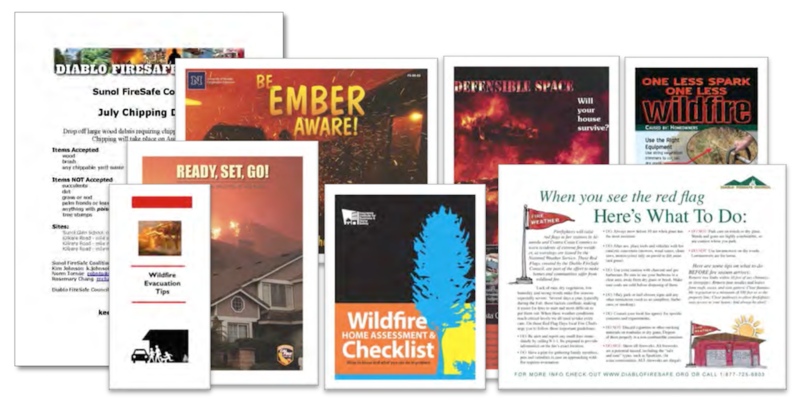 A Community Wildfire Protection Plan (CWPP) is a collaboratively developed plan that identifies wildland fire hazards, prioritizes way to reduce those hazards and recommends measures for homeowners and communities to reduce ignitability of structures. DFSC has been working with community members and agency partners during 2017 to focus the existing Alameda County plan adopted in 2012 on Sunol. See Planning Process for more detail. 1. The plan is the opportunity to influence where and how federal agencies implement fuel reduction project on federal lands. 2. The plan establishes priority for funding of hazardous fuel reduction projects and allows stakeholders to coordinate their activities. The Sunol Wildfire Action allows us to focus the 2012 Alameda County Community Wildfire Protection Plan to address specific high fire hazard areas in the Sunol community to reduce the risk of loss of life and property due to wildfire. Since the Alameda County Plan was adopted, DFSC was able to secure grants for a program to fund neighborhood projects create defensible space. To learn more about this program see Vegetation Removal. We hope you can join us as we implement the plan to reduce the impact of wildfire on our Alameda County communities. To be added to our mailing list to hear about future events contact: Cheryl Miller, DFSC Executive Director. DFSCMiller@comcast.net phone: 510-282-1265.